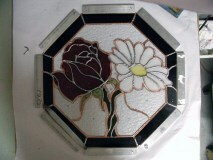 I designed and created this piece for a friend who gave it as a wedding gift to his son and daughter-in-law. His son loves roses and the bride loves daisies, and I wanted to show their favorite flowers intertwined to represent their joining together in marriage. 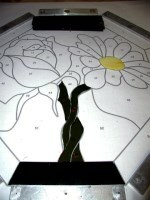 I designed the panel for an octagonal window in the couple's new home. My friend installed "Rose and Daisy" while the newlyweds were on their honeymoon, which gave them a pleasant surprise upon their return! 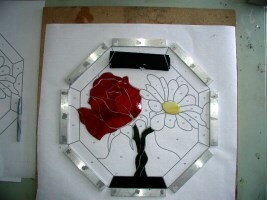 The design itself was not difficult, but it was a bit time consuming. To add more depth to the flowers, I rotated the glass so that the pattern within the glass would look like the natural veins in the flowers. To get the pieces to fit together, I relied heavily on my grinder and paint pens. Glass Eye 2000 has made it so much easier for me to make panels! Most of my designs start as hand sketches. With scanning and adding it as a background to trace, I'm able to take sketches and size them perfectly per my client's wishes. The ability to print and/or email a color JPEG to my clients has made it simple to show them exactly what the finished piece will look like. I've even incorporated Glass Eye 2000 designs into photos of the client's window so they can see exactly what it will look like in that spot. 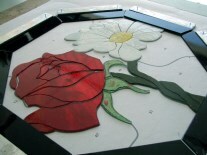 Glass Eye 2000 is not only a great tool for producing beautiful stained glass pieces but it's also a great marketing tool. Barbara Merchant and her husband purchased a home in North Las Vegas in 2002. They decided that they wanted some stained glass art in their new home, and when they couldn't find the "perfect" pieces for the windows over their French doors, they knew it was time to take matters into their own hands. 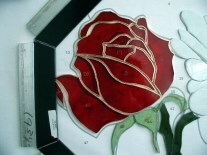 They took a stained glass class through University of Las Vegas and the addiction began. In 2009, Barbara became a victim of the economy and was laid off from her full-time job. 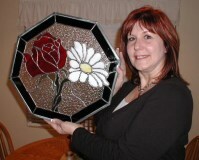 She used this opportunity to start up a business named "Those in Glass Houses…" In addition to designing and creating custom stained glass pieces for sale, she also gives back to her community by donating panels to various non-profit groups in the Las Vegas Valley such as Adam's Place for Grief, Chefs for Kids and the American Lung Association, to name just a few. To see these pieces and more, you can go to her website as well as her Facebook page.